Gorgeous before they hit the water, Mazzi and Erez Peled's handmade fizzers are spectacular once they do. When we first saw Mazzi and Erez Peled's gorgeous, handmade fizzers, we wanted to call up a museum and ask, "Can bath bombs be art?" Their vivid colors and hand-painted glitter are dazzling even before they put on their three-minute scent, color, and fizz show. This set of nine will provide hours of divinely inspired soaking for beloved bridesmaids, loyal sisters, and teens who have behaved very well. Certified cruelty-free by PETA. Handmade in Austin, Texas. Lavender, Milk & Honey, and Olive Grove: Hand decorated with a gold mica brush stroke. Unicorn, Universe, Mermaid and Guava Goji: In bright colors with gold glitter. Suntans & Coconuts, Snowflake: Hand drizzled with copper or gold mica. Directions and tips to enjoy your bath bomb: Unwrap your bath bomb. We shrink wrap our bath bombs to maintain freshness. Fill your bath tub at least 3/4 full with warm water Place your bath bomb in the water. 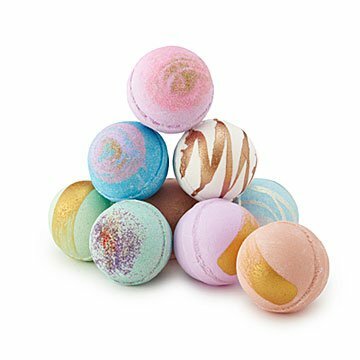 Enjoy the fizzing bubbles, the scent, color and extra moisturizing butters and oils. When you are done, rinse your tub with water.